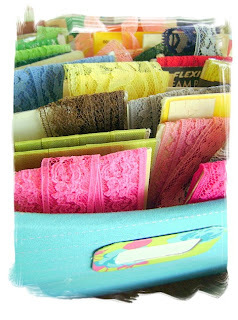 I was so-so excited to find a large bag of vintage seam binding and lace during a recent treasure hunting expedition. After getting home and opening, or ripping the bag apart like a child on Christmas Day (either one works), I found 60 packages of seam binding and lace in the most perfect shades of pinks, greens, and yellows. I've tried to explain to my husband how truly monumental of a find this was, but he doesn't seem that awe-struck by it. and so, I dedicate a whole blog post to old sewing things that will be used on new scrappy projects. So, I took everyone's advice and sorted through everything to make smaller ( & more manageable) little groups! I'll warn everyone now though, that my photos are less than stellar. I'm so use to having alot of time on my hands to arrange my photos and spend the time editing, well, with 2 little ones now, I don't have so much spare time anymore. I'm taking a 'good enough' approach to my photographs this time around. I'm hoping for Saturday and Sunday to get everything into the store. I've made groups of buttons, stickers/rubons, Prima/Making Memories flowers, ribbon, a couple of smaller scrapbook kits and 1 big-huge one, Jolees, idea books and magazines, stamps, chipboard shapes, titles and journal tags, paper packs..... that might be everything. I love Spring cleaning!! 46 cards of vintage buttons. (I've been collecting these for a little while!) I love using whole cards of buttons for scrapbooking!! I've been spending a few weeks now reorganizing my studio. I've already went through and sold locally all of my paper, because there is nothing in the world that I hate to ship more than scrapbook paper. But now I have two huge boxes of embellishments and other crafty things to sell. But I need some advice! What is the easiest way to sell everything? **The last time I cleared out my studio I sold everything all at once in one very large, very heavy box. I'm thinking that would be the easiest thing for me to do. The thought of having to photograph every item is a little overwhelming. Any good ideas out there?? If life worked as a drive up window.. I'll take 3 cases of Bronchitis, (1 for me and each of the kids) 3 trips to the doctors and pharmacy, 4 boxes of tissues, and 2 breathing treatment machines. will that complete your order? It does kind of make me laugh when I think about how bad this past week has been. It's been very eventful, both good and bad. I had lots of time to think while I was sick and suppose to be sleeping. (Thank the heavens above that my husband is as helpful as he is!! He's a good little nurse to us when we're all sick!) It seems though that we're slowly getting over it. Chase and Alaina are on meds and are doing breathing treatments every 4 hours. Two little kids sick at the same time has been quite the adventure..... one I'm hoping I won't be going back on any time soon! I added in a little blank notebook, because I know that I'm always looking for something to write on when I have an amazing idea (in my opinion of course). 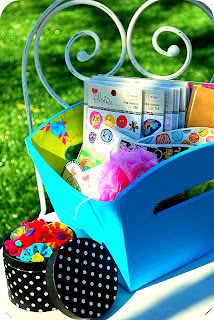 Color combos, scrapbook page sketches, ideas for embellishments.... my list could go on and on! sick.......again. How does one catch 2 colds in 2 months? Luck I suppose, mixed with a little talent. I've traded catching up on emails for sleep. Chase is also sick, it makes for a very long and tiring day. If you're waiting on an email, it's coming, hopefully this weekend. (Sunday & Monday) I'm off to make some more peppermint tea and start a pot of chicken noodle soup. ever had one of those weeks? Where you look at your inbox, expecting to see 'Bill Notification' and instead are greeted with an email subject line that makes you look twice? I have! 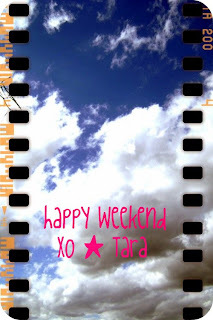 This past week has been so unexpected and out of the ordinary but exciting and busy all at the same time! The store and one of my scrapbook pages are being published!! Yay for handmade!! and drumroll please............... I'm now designing for Danielle Thompson with Kitschy Digitals!! I've been a fan of hers for so long, well since I got into scrapbooking about 4 years ago! I'm so overjoyed at the opportunity to be working alongside some incredible talent! I don't think I could ever fully commit to only digital layouts, I love paper and glue too much, but hybrid layouts are right up my alley, and so I'm very fortunate to be designing with such gorgeous digital kits. 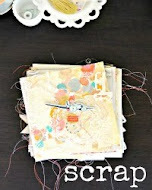 It truly makes scrapbooking easy when you love the products you work with. With that said, here is the newest page I made yesterday morning, the whole page took about an hour! I really wanted the focus and the color to only be Danielle's products so I started this page by taping the edges with some scotch tape, then took 2 pieces of lace and placed them over the paper and spray painted with black to give the pattern of the lace. (I wanted more of the teal to show through and less of the actual lace.) All of those packages of Basic Grey rub-ons I've been collecting over the years came in handy! I added the rub-ons over the spray painted areas. I printed the feathers and flowers/leaves onto textured cardstock, and then cut each out and layered everything together, add in some real feathers and voilà! It is finished!! A super simple and quick layout, with a little punch of color!